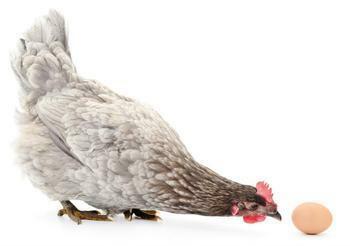 Are those eggs you're scrambling really from "free-range" chickens? What is a free-range chicken anyway? A federal appeals court has said it's not a question that requires a federal rule-making process. The Ninth Circuit Court of Appeals on Monday turned aside an appeal from the Animal Legal Defense Fund and Compassion Over Killing, which have been trying to get federal agencies to impose strict rules on how eggs should be labeled. Various federal agencies, including the Food and Drug Administration, the Federal Tade Commission and the Agriculture Department, all have some jurisdiction in the matter but have traditionally enforced labeling on a case-by-case basis. The groups argued that egg carton labels feature images or phrases that suggest hens are raised outdoors with space to move freely when the hens are in fact raised in restrictive cages. But the appeals court said the agencies had the authority to decide how to handle egg labeling. The animal rights groups said they would not give up. “We are undeterred,” Animal Legal Defense Fund attorney Kelsey Eberly said. “We’re not going to let this loss hold us back.” She said the groups would continue to file lawsuits demanding action by the federal agencies. If a chicken can't cross the road, are its eggs organic?